WIN! 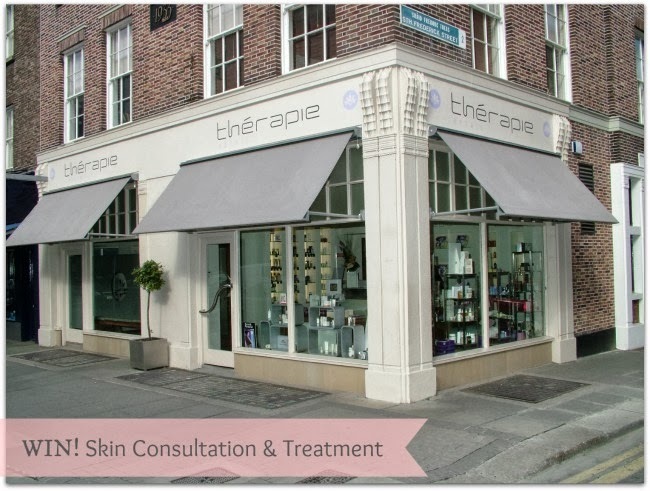 Expert Skin Consultation and Dr Murad Facial Treatment at Therapie Clinic, worth €300! Therapie Clinic might be best known for their laser hair removal, but did you know they also offer the most advanced and high-tech skin and body treatments? They offer everything from luxury facials to treatments for common skin concerns such as redness and red veins, pigmentation, acne and acne scarring to the holy grail of them all - anti-ageing! You may have also heard of their fat-freezing Cooltec body treatment, a non-invasive treatment that banishes unwanted lumps and bumps. Irish owned, the first clinic was established on Dublin’s Molesworth Street in 2001 and there are now clinics all over the country; in Cork, Galway, Waterford, Limerick, Athlone and Northern Ireland. We've teamed up to offer a Fluff and Fripperies reader an expert skin consultation at Therapie Clinic, with their super high-tech, Dr Murad skin scanner*, followed by a recommended facial treatment - worth a whopping €300 combined. The skin scanner is designed to measure skin health and will even show how your skin is likely to age in 5 -10 years time. The good news is that it will also make the right recommendations for you and your skin, to improve how your skin will age. This one is only open on the island of Ireland as you have to be able to make it to a clinic to redeem your prize. But check out yesterday’s giveaway, which is open worldwide, and stay tuned for more in the days and weeks to come! Oh wow. That's an amazing prize! Can they turn back time, please!? My poor skin could really do with this! Another fab giveaway, please count me in! Love Dr Murad skincare would like to try some more it! Am also intrigued and scared by the skin scanner!! I could do with this Emma! Fantastic prize! Maybe they could do something with my bedraggled skin! Gorgeous giveaway Emma! I’m in to win! Incredible giveaway Emma! So useful for whoever wins! What a giveaway! Would love this! With the central heating at home and the air con heating in the office, my skin desperately needs sorting out. Would love to win this prize! My face is such a disgrace right now that I really need something like this! fantastic prize. My 'more mature' skin could do with this!! Ah I wish I could win a trip to Dublin and then a spa treatment here. One day I will get to Ireland. What a prize! I would love this!